Richard is the composer in residence at the world famous Fairey Band. Richard comes from Drogheda in Ireland. After graduating with a Diploma in Software Development from Dundalk IT he worked in the computer industry for several years before embarking on a musical career. His musical background started on Tenor Horn for the Drogheda Brass Band. As well as playing brass he also sang in choirs such as Camerata and the Irish Youth Choir. He has enjoyed several tours and CDs with the IYC. After attending the Royal Irish Academy of Music in Dublin Richard then moved to England in 2002 to study for a BA (Hons) in Music, MA and PhD in composition at the University of Salford. While at the University Richard won the prestigious Kirklees Composition Competition in 2005 and also received the inaugural Lomas Achievement Award. In the UK Richard has been a member of the Halle Choir, Stallybridge Old, Besses O’th Barn and YBS and Hammonds Saltaire Brass Band. Richard has had numerous works commissioned for Brass Band - including performances on BBC radio, at Brass in Concert and the European Brass Championships, and other ensembles as far afield as Norway, Canada, Australia and Japan. Richard has recently worked with Turner Prize winner Jeremy Deller writing 13 pieces for Acid Brass II 'In Yer Face', ten of which have been recorded by the Fairey Brass Band. He also produced the CD 'A Musical Life' recorded by the Leyland band under conductor Richard Evans, and has had the premiere performance of his piece 'Vita Nuova' by the Voxare String Quartet based in New York. Since 2008 Richard has also had the privilege of writing and arranging the music for the University of Salford graduation ceremonies, a task which involves creating a 30 minute entertainment programme before each ceremony. This is performed on the main stage at the Lowry Theatre on Salford Quays. He is currently involved in many other projects ranging from upcoming CDs, festival performances with Brass Bands and other ensembles based in and outside of the UK. Richard is also one of the founding members of ‘New Sense Brass’, a Third Stream ensemble which explores and combines many various styles of popular music from Big Band, Jazz and Funk to Brass Band and other classical idioms. With the group he has enjoyed several performances in both the UK and Canada. The band has recently released its first CD 'Between the Lines', which includes a number of arrangements and original tunes written by Richard. Richard’s works have been published with Kirklees Music, Obrasso, Prima Vista Musikk, Pennine Music and OffBeat Publishing. In 2008 Richard became the Assistant Concert Manager at the University of Salford’s Music Directorate. In this role he supports the day to day running of the performance program which includes among other things concerts, rehearsals, masterclasses, workshops and tours. Recent events include ‘BBC Discovering Music’ with BBC Radio 3 and ‘BBC Blast’. Richard also teaches Arts Administration and Composition. 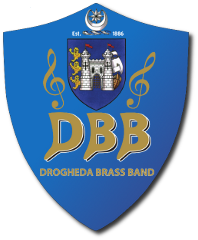 Richard regularly visits and plays with the Drogheda Brass Band at concerts, competitions, fund-raisers and community events. He also gives his time to help organise the band’s annual summer workshop Summer Sounds. We hope this continues for many years to come.